The soldiers had rounded up about 120 Lakota men and over 240 Lakota women and children (numbers vary with source) on December 28th and had herded them back toward the Pine Ridge Indian Reservation intending to disarm the men the next day. Prior to taking the weapons of the Lakota, the Army commander, Col. James Forsyth, had many of his 490 men surround the camp, including 4 artillery pieces. 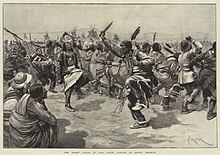 The Lakota wanted to perform the Ghost Dance and the Col. Forsyth was impatient about disarming the Lakota that had the gall to wander off the reservation. Prior to this incident, the US Government had been moving the Native Americans around to smaller and smaller and less desirable locations for some time, creating animosity toward the government. Tensions grew between the soldiers and the Lakota as some outspoken Lakota worked up their comrades. As the soldiers gathered the weapons, a rifle discharged accidentally, creating instant panic among the soldiers who began killing Lakota as fast as they could! The virtually disarmed Lakota fought back, but few had weapons. The soldiers killed men, women and children indiscriminately, killing about 90 of the men and as many as over 200 women and children. Perhaps half the Lakota dead were killed quickly in the first few minutes, the rest, including Chief Spotted Elk, were run down and killed by soldiers that were no longer under the control of their officers. The killing lasted about an hour. The Lakota managed to kill 25 soldiers outright, and wound another 39, 6 of which later died of their wounds. It is highly possible if not likely that some of the killed or wounded soldiers were killed by “friendly fire” from their own Hotchkiss artillery pieces. The plains Indians, including the Lakota, had been severely hindered by the slaughter of the bison on the Great Plains, an intentional campaign by the US Government to deprive Indians of their sustenance, forcing the Native tribes to live on reservations where at least they would not starve. Obviously, the Native People felt they were being rounded up and held prisoner, unable to follow their nomadic lifestyle they had enjoyed for centuries (or millennia). In 1990 the US Congress finally apologized for the massacre, and in 1965 the Wounded Knee Battlefield was declared a National Historic Landmark, and put on the National Register of Historic Places the following year. Although Wounded Knee is often called the last battle between Whites and Indians, another fight broke out the next day near the Pine Ridge Reservation although we were unable to find data on casualties). Thus ended a conflict between European colonizers and nation builders and the original people on the lands of America, bringing the complicated questions about what “could have” and “should have” been done differently by the people that settled and built the United States in regards to the Native Americans. Would it have been possible to build a great country without stealing the land by force? Do the ends justify the means? Please give us your opinions about this highly emotional subject. A fictionalized version of the “battle” has recently been depicted/referenced in the popular video game BioShock Infinite (2013). Richardson, Heather Cox. Wounded Knee: Party Politics and the Road to an American Massacre. Basic Books, 2011.